P. 118x86 mm. S. 225x163 mm. 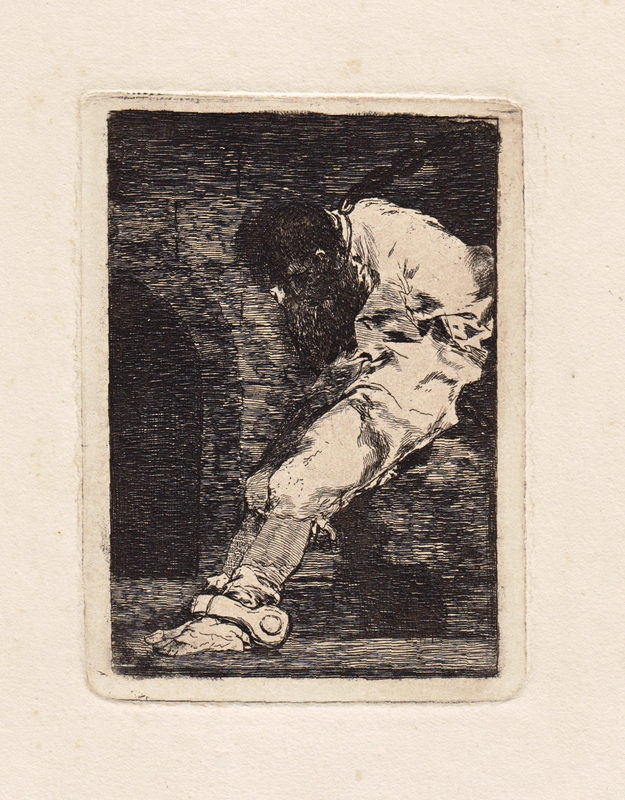 This is one of a series of three small etchings of prisoners showing their barbarous mistreatment that Goya produced in the mid-1810s, probably around the same time as the powerful set of eighty plates relating the Peninsular War and denouncing its atrocities, Los Desastres de la Guerra. Likewise, they were not printed in editions until well after Goya's death. The title given by Harris derives from an annotated impression of the 1st state included in the Ceán Bermúdez Album. According to Valentín Carderera (who wrote the first biography of the artist and was one of his earliest collectors), this plate was purchased by John Savile Lumley in 1859 (see Tomás Harris, Vol. I, page 87), along with several others; Lumley also printed them on the same laid paper and at the same time as the Calcografía edition in 1859. It thus seems clear that the trial proofs of the prisoners, which Harris describes as "Posthumous before 1859" were printed before Lumley's acquisition. A more exact dating of these trial proofs is as yet impossible. The only other known impression of the present trial proof, again according to Harris, is held in the Rosenwald collection, now in the National Gallery of Art, Washington, D.C. (http://www.nga.gov/content/ngaweb/Collection/art-object-page.39833.html). Comparing these two impressions (along with known edition impressions**), our trial proof impression shows differences in printing technique, printing more crisply, and appearing more cleanly wiped (showing finer detail in the dark areas, notably the the head, chest, far thigh, and doorway). Note also the sharp clamp marks (upper left plate edge) that no longer show in the edition. * In pencil, a partly effaced French annotation in a 19th century hand, "M Carderera en a le dessin à la sépia" over which a later hand has written "GOYA".